From boilers to on-road mobile equipment to roof top AC condensers on commercial building near the ocean, industrial and commercial heat exchangers often come under attack from corrosive contaminants that reduce their ability to transfer heat, causing stresses on the mechanical entire system. Case Study 1: From hydroxides to chlorides and mining in the Great Salt Lake, this magnesium mining group was at its wits end as its heat exchangers experienced continual disintegration and complete destruction in as little as 6 months. Since we have been CoreKoting heat exchangers for them, now 6 years, we have not had a single comeback. From chicken farms to mushroom farms to fertilizer-application equipment, CoreKote extends the life of the heat exchangers used in this industry — from transmission coolers to axle coolers to charge air coolers, and any other heat exchanger on any of this equipment, by a factor of 5+ times. Case Study 1: Pennsylvania mushroom growers contacted Se-Cliff. Their heat exchangers on their power gen units were failing. Most of the time, the units lasted up to — but very few longer than — 6 months. Apparently, the liquid fertilizer used, a slurry of chicken poop and water, is extremely corrosive. We will be shortly passing our 7-year warranty time frame this upcoming 2018 Fall. Case Study 2: CoreKote has been e-Coating heat exchangers for chicken and beef agribusinesses since 1997. Currently, we have e-Coated units for over 2 dozen of these facilities without any failures to date. Corrosion is a common, pervasive, and extremely costly problem across all sectors of the Petro/Chemical industries. Metal corrodes in the presence of (salt) water, oxygen, CO2, sour gas, acids used for a variety of purposes in both industries, use of other corrosive materials, and other naturally occurring corrosive contaminants. After almost 20 years preventing all the various corrosion modalities on ocean platforms, oil fields on land, and chemical plants, we have accurately estimated the average lifespan of an Uncoated heat exchanger is between 1.5 to 3.2 years. On the other hand, our experience also shows that CoreKoted units' "useful" life averages between 9.1 and 11.4 years in both industries. We offer a 7-year warranty that CoreKoted units, when power washed regularly and with coolant fluid changes at suggested intervals, will not fail as a result of external corrosion. Case Study: Three CAT power generators' heat exchangers had continued to corrode and degrade on the prevailing-wind side of an oil platform located in the Gulf of Mexico, all failed during a 9-month time period. After CoreKoting these units in late 2008, when we last checked (October 2016) with the owner/operator, the units were functioning. Simple maintenance, maintaining coolant fluids and power washing the units' fin nests, have saved tremendous replacement and breakdown costs. It has long been known that the sulfite pulp maker, using sulfur sulfide and sodium hydroxide at elevated temperatures and pressures, has serious corrosion-causing issues, along with those pulp plants that use alkaline solutions to produce their pulps. The chlorides in the bleaches used are also a major concern. Se-Cliff has been CoreKoting heat exchangers for the pulp industry for 9 years, with no comebacks or complaints to date. Extending their production, and reducing their unexpected breakdowns — which can become a huge mess — is a godsend to this industry. Se-Cliff has been CoreKoting heat exchangers on ships, oil platforms, and docks for over 20 years. Failure analyses data show an average lifetime of 8.6 years for CoreKoted units. The not-so-obvious "data" is that, after many years in service, these CoreKoted heat exchangers are maintaining their heat transfer system's ability to control emission particulates, and in most cases, continuing to eliminate dense exhaust smoke from incomplete combustion. Case Study 1: On several LA Port Authority docks, there are dozens of CoreKoted heat exchangers on power generator sets that continue to maintain near-originally designed rates of heat transfer, after being in service for 7+ years. This information is anecdotal and is based upon observations of service managers who report a small decrease in fuel consumption, no overheating conditions, and upon startup, no excessive exhaust smoke. Case Study 2: A crane that moves material can be the heart of an oil platform, and if the heat exchanger fails on the unit, production can stop. The repair scenario? Call a radiator maker and give them the specs on the failed unit. Then wait for the unit to be made. Then picked up and transported to a helipad where a qualified and insured radiator repairman will air travel with the unit to the platform. Then finally be replaced. This scenario usually takes between 24 and 36 hours. Enormous production profits are lost, sometimes in the millions of dollars, including costs to replace and repair — the cost of the new unit, repairman costs, and transportation costs, with helicopter services reaching as high as $25,000/trip. Uncoated heat exchangers on oil platform cranes can fail in as little as 20 months, and usually last about 3 years. Compare those costs with the cost to CoreKote a standard crane heat exchanger — $600 to $800. You will clearly see the sense of spending a few dollars upfront to save big production-profit losses and repair and replacement costs on the back end. We currently CoreKote units for 3 crane companies, saving their customers enormous costs. At the same time, these crane makers prove to their customers that each of them cares about providing the best equipment for their dollar. Case Study 3: In addition to CoreKoting heat exchangers for this industry, we provide InterKote for aluminum and steel parts. The coating penetrates any open pores on these metal surfaces, and retards corrosion. We currently InterKote aluminum parts that are visible on boats, with owners now replacing corroded stainless parts with aluminum InterKoted parts. We InterKote exhaust pipes for the boats' engines, and also do so for show cars and trucks. Case Studies: Se-Cliff started CoreKoting for the mushroom farm industry about ten years ago. 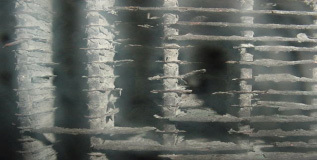 To date, there have been no failures of heat exchangers due to external corrosion. The same is true for both the meat packing and poultry industries which we have providing corrosion protection across the US for over five years, again with no comebacks. Se-Cliff guarantees its CoreKote e-Coating to maintain and extend a heat exchanger's "useful life" for a period of 7 years. 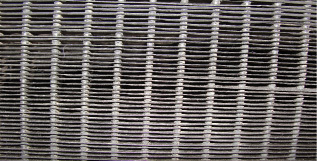 "Useful life," in terms of a heat exchanger, is defined as a heat exchanger's ability to retain approximately 90% of its originally designed rate of heat transfer after 7 years of in-field use. Note: Even if an uncoated unit lasts several years, its ability to maintain an effectual rate of heat transfer is seriously limited by the buildup of surface corrosion contaminants on fins and tubes. This buildup is composed of oxides which actually insulate the metal surface. Fins being the primary surface transporting heat, insulating them with oxides drastically inhibits heat transfer and increases the likelihood of overheating and breakdown. CoreKoted units meet the demands as defined by useful life. Contact Tom Clifford or Steve Basil today for more information.